To supply specialized trading desks to the financial industry, SBFI relies on effective e-mail communication. The firm needed to upgrade Microsoft Exchange 2000 Server e-mail messaging and collaboration software and wanted to switch to a hosted service. 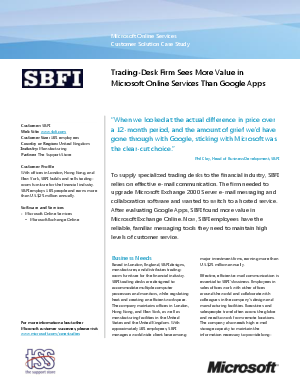 After evaluating Google Apps, SBFI found more value in Microsoft Exchange Online. Now, SBFI employees have the reliable, familiar messaging tools they need to maintain high levels of customer service.